Red Birch is a fast-growing landscape and resin yielding tree native to tropical America, its natural range extending from Florida through Central American and the Caribbean to northern parts of South America. It is typically 10 to 15 m (30 to 50 ft) tall, though may reach up to 30 m (100 ft) in natural forests, and on open sites develops a straight, uniform trunk supporting a rounded crown, sometimes with wildly curving and twisting branches. 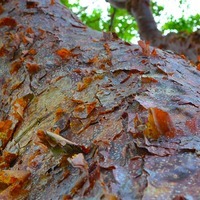 Its most distinguishing feature is its lustrous copper coloured bark which cracks and peels off in thin, near translucent flakes. 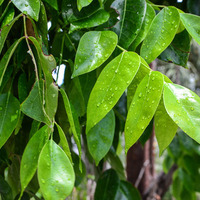 The leaves are compound, being made up of three to nine oval leaflets, each up to 7.5 cm (3 in) long, arranged in pairs along the length and with an extra leaflet at the tip. They fall off the tree in the dry season to conserve water, leaving the branches exposed. The new leaflets emerge glossy lime-green then gradually change to dark green. A stem-succulent tree, it also conserves water by storing it in its stems. The flowers are small, pale green-white and bloom in loose clusters at around the same time as the new leaves start to develop, but are also know to bloom on and off throughout the year in watered landscapes. It is a dioecious species, with female and male flowers borne on separate trees. The fruit are small, three-sided green berries that become pink-red when ripe, usually eight to ten months after flowering is ended. 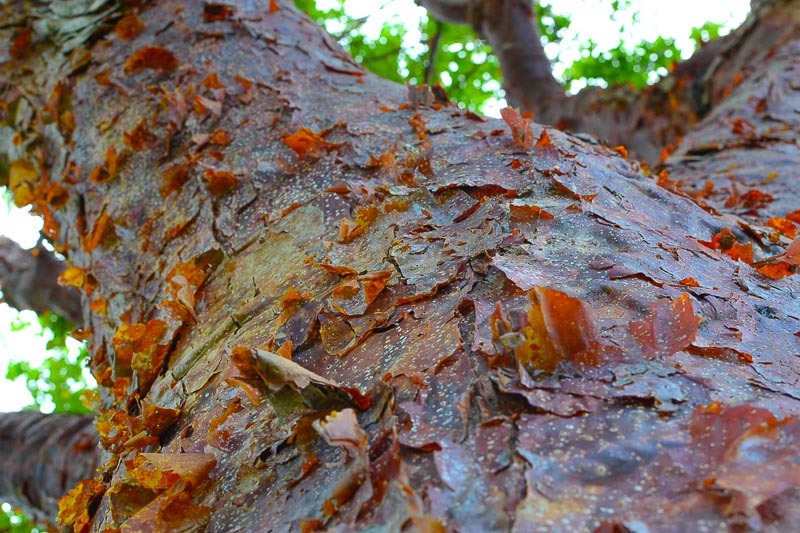 In its native range, it is cultivated as a landscape tree for its lustrous, copper coloured bark and its suitability for coastal environments, on account of its ability to withstand salt spray blowing off the sea. 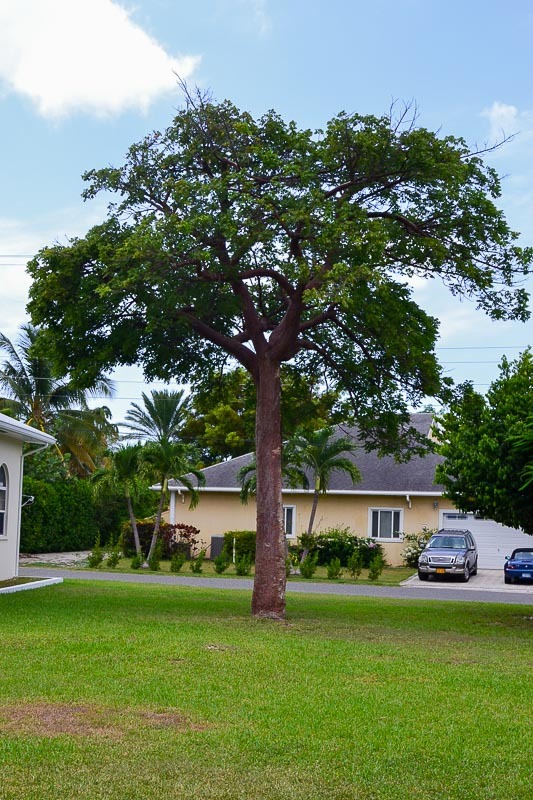 The wood is light-weight, in the 300 to 400 kg per cubic meter (19 to 25 lbs per cubic ft) range and is low in natural resistance to decay and termites. This classes it as a non-durable softwood, limiting its suitability for building and construction work. It also has a high moisture content, but when properly dried is cut up for firewood and for making charcoal, though it is not an ideal wood for either purpose. Its main uses range from making plywood, boxes and crates to making matchsticks and toothpicks. The bark on wounding yields a resin that is left to ooze and harden on the trunk before before being collected and burnt as incense. The resin has also long been used in it unhardened form as a glue, particularly for mending broken crockery. Both the resin and crushed leaves have a strong odour of turpentine. 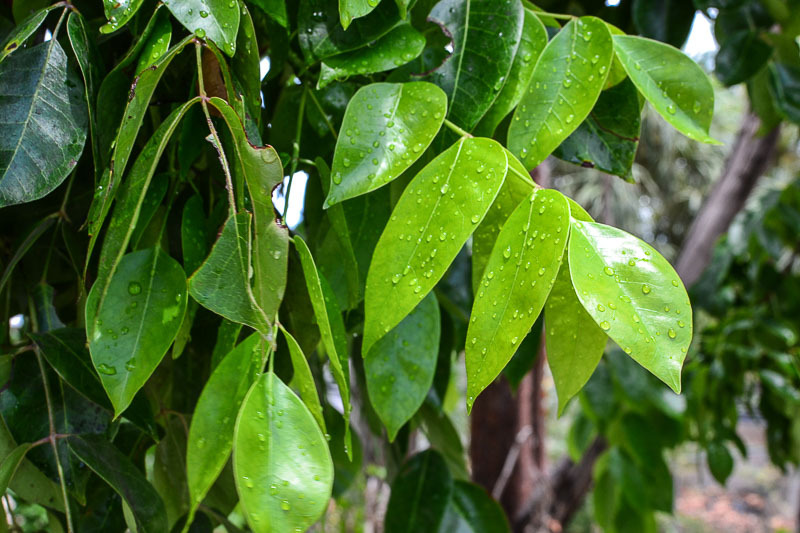 It grows naturally in seasonally dry, sub-humid to moderately humid tropical lowland forests, generally in areas with annual lows of 17 to 25 °C, annual highs of 27 to 35 °C, annual rainfall of 500 to 3000 mm and a dry season of 3 to 8 months. New plants can be started from seed or cuttings, which are quick to take root. It performs well on free draining clay, loam, sand and high calcareous or limestone soils of a moderately acid to alkaline nature, generally with a pH of 5.5 to 8.5 and on sites with full to partial sun exposure. Being a stem succulent species it has good tolerance to drought conditions and is moderately tolerant of salt spray. Birds and small animals eat the fruit and disperse the seed. However, there does not appear to be any records of escape and naturalisation anywhere, despite its widespread cultivation. 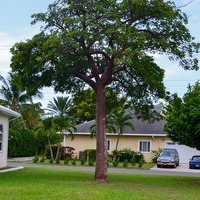 Mature trees produce surface roots, which can be a problem if planted near to paved structures, such as paved walkways. Reports of its wind tolerance are conflicting, varying from high to low breakage resistance, which may result from seasonal change in wood moisture content. Burns R.M., Mosquera M.S. & Whitmone J.L. 1998, Useful trees of the tropical region of North America, North American Forestry Commission Publication (Number 3), Washington D.C.
National Research Council (Board on Science and Technology for International Development) 1983, Firewood crops : shrub and tree species for energy production (Volume 2), The National Academies Press, Washington D. C.
Vozzo, J. A 2002, Tropical tree seed manual, U.S. Department of Agriculture (USDA), Forest Service, Washington D.C.
Borchert, R., & Rivera, G. 2001, Photoperiodic control of seasonal development and dormancy in tropical stem-succulent trees, Tree Physiology 21.4 (2001): 213-221.